Bioderma has just introduced a number of new products to the Irish market which is always an exciting release. The one that has caught my attention is the Ultra nourishing anti irritation shower oil. To explain why I have been drawn to this particular product I go back a few months to my little boy(1) being rushed to hospital with suspected menangitis. While thankfully the suspicions were unfounded he was still seriously ill. After a number of tests we found out he had a bacterial blood infection caused by staphylococcus bacteria. This bacteria lives on all of our skin but my little man had rubbed it into his bloodstream through a small patch of eczema under his eye. It was a truly terrifying time for us and took almost two weeks on iv antibiotics and a couple of overnights in hospital to be cleared. After that it took about 3 months for his little body and happy self to return to normal. The skin barrier therapy patent of this oil claims to biologically prevent the binding of staphylococcus bacteria. What I understand from this is that the formula protects the skin from being attacked by this bacteria that causes flare ups in dry skin conditions. For me anything that can reduce the likelihood of this bacteria entering the bloodstream is definitely worth a try! I started using the shower oil about a week ago to clean the little mans face and behind his knees morning and evening (where he has his eczema) and then using all over in his bath. After two days I could notice an enormous improvement in the skin on his face and had a few others comment on how much better it was looking. I then picked up the atoderm cream and have been using that along with the oil. I'm so impressed with how this is working. For the very first time my baby has baby soft skin not rough skin with giant red flare ups. I've only been using it on him for a short time so I hope it continues to impress but with the science behind it's definitely one I'll keep using with my fingers crossed I never hear the word staphylococcus infection again. I have focused on the barrier therapy part of this product but they're are also some other great points about it. It feels lovely 😊 it claims to be a non greasy oil and it really isn't , it's a pleasure to use as is the cream. It also contains vegetable biolipids and vitamin PP which do the following. Vegetal biolipids* soothe the feeling of tightness and increase the resistance of the skin by recreating a protective film of the skin. Vitamin PP, capable of increasing the synthesis of lipids, helps to restore the skin barrier which improves the skin's suppleness and durably restores comfort. It can be used by anyone from 0 months to 100+ years. It retails for €7.50 for 200ml and €15.50 for 1litre so for anyone used to buying products for eczema it's definitely on the affordable side . 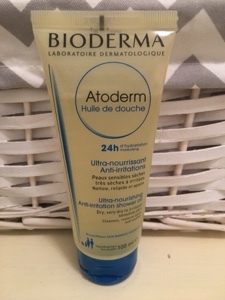 Among Bioderma new releases they have a hydrobio mask. I'm hoping to get my hands on this really soon and this one will be all for me!